Cell therapy is changing the way that we view modern medicine and certain medical ailments. The increase in research in this area of medicine is providing treatment for ailments never before perceived to be treatable. With studies being performed at major universities across the country, innovation is at the center of cell therapy. Eligible costs include employee wages, cost of supplies, cost of testing, contract research expenses, and costs associated with developing a patent. On January 2, 2013, President Obama signed the bill extending the R&D Tax Credit for the 2012 and 2013 tax years. Cell therapy is defined as the administration of live whole cells or the maturation of a specific cell population in a patient for the treatment of disease. The usage of live cells has been around for some time now and is expanding. Everyday procedures such as blood transfusions, bone marrow transplant and solid organ transplants have benefitted patients for a number of years and although they involve cell therapy these procedures are pretty typical in today's society. In an attempt to increase our knowledge of cell therapy the cell manufacturing process is being expanded. The cell manufacturing process is illustrated below. The development of autologous stem cells proved to be a huge advancement in the cell manufacturing process. These cells are removed, stored and later given back to the same person making cell therapy much simpler. Cell therapy is being expanded by learning how to use all different types of cells. For example, research is occurring for cardiac, muscular, bone marrow and many other types of cells. 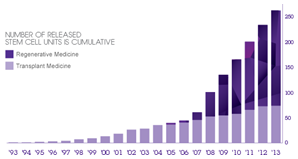 All and all, usage of cell therapy is up by a significant amount and is expected to continually increase as illustrated below. The UC Davis Vascular Center at the University of California recently launched a cell therapy study to reduce amputations from vascular disease and diabetes. A member of the center, John Laird, is quoted saying "We are deeply committed to finding alternatives to amputations that save lives and improve quality of life for vascular patients." In the future this is a huge possibility; through research they are finding ways to increase blood circulation in their attempts to prevent amputations. The institute's goals are to develop new and safe therapies. They have teams focused on preventing amputation in addition to, hearing loss, bladder disease, bone repair, vision regeneration as well as many other fields. Scientists at the University of Wisconsin-Madison have recently found that neurons made from embryonic stem cells both can send and receive nerve impulses when transplanted into the tests brain. This is important because it can help in curing ALS, otherwise known as Lou Gehrig's disease. The study that was accomplished is one of the first to provide substantial evidence that stem cell derived neurons can fully integrate like regular neurons. These neurons can be used in curing Parkinson's disease, epilepsy and strokes as well. Research being performed at Rice University is further expanding the work that has already been done by a Rice biochemist named Dmitri Lapotko. Dr. Lapotko has previously found ways to inject drugs directly to cancer cells by using nanobubbles. The nanobubbles help in multi tasking by destroying unwanted cells in addition to treating stricken cells by punching holes in their walls and injecting drugs or genes into them. The process is very safe, efficient, selective, fast and Dr. Lapotko has said "We'd like for this to be a universal platform for cell and gene therapy and for stem cell transplantation". The future research at Rice will have a substantial impact on the medical field. In 2008 the state of Michigan passed a constitutional amendment allowing for the use of new embryonic cells. By 2009 the University of Michigan had put together a campus wide team that was responsible for forming the Consortium for Stem Cell Therapies. This program became responsible for the derivation and distribution of newly induced pluripotent stem cells and human embryonic stem cells. In Michigan there's a focus on innovation in order to rapidly move new cell therapies through their trials and into the medical world. Michigan has studied cell therapy so extensively that they have found a key ingredient in Silly Putty to actually help in the development of spinal cells. In their study they found that a spongy surface helps to develop spinal cells as opposed to muscle, bone, nerve or organ cells. The Silly Putty ingredient helps to attain that spongy surface. Alfred Taubman, who Michigan's research institute is named after, has been quoted saying "Embryonic stem cell research is the most important advancement in medical science since the advent of antibiotics a half century ago." Stony Brook University is the only cell therapy research center on Long Island and one of two in New York State. Stony Brook is in the process of studying cardiovascular diseases. There are many types of cardiovascular disease such as coronary artery disease, cardiomyopathy, heart failure, cerebrovascular disease, valvular heart disease, cardiac dysrhythimias and hypertensive heart disease. Currently Stony Brook researchers are studying cell therapy usage for cardiovascular disease by using a combination of transgenic and cell transplantation methods to probe the signaling requirements within individual stem cells. Additionally their division of cardiology is participating in a clinical trial on mesenchymal stem cells (MSC's) which can be used to treat individuals after their first heart attack. After a heart attack permanent damage will occur. Approximately 18 percent of men and 23 percent of women die within a year of their first heart attack. By using MSC's this number can be decreased substantially. Recent research at Harvard University has discovered that stem cells can be used to regenerate dentin. Dentin is the hard, dense, bony tissue that forms the bulk of a tooth beneath the enamel. By testing rodent molars, researchers treated stem cell rich tooth pulp with a laser therapy that spurred the growth of hard tissue dentin in teeth. The scientists injured two rodent molars and proceeded to administer a simple laser treatment on one of them. After just a five minute treatment the tooth receiving treatment showed double the amount of regeneration as the untreated tooth. According to the researchers they plan on applying this to humans in the future. A recent study performed at the University of Oxford has found evidence of cancer stem cells. Through research genetic mutations in human patients were tracked and researched linked cancer growth to a potential origin point. Normal stem cells and cancer stem cells both function in the same way theoretically. There is now a possibility of an important development in cancer research and treatment by helping to identify and terminate the source of cancer growth. With Universities around the world contributing in researching cell therapy many new avenues of treatment are becoming possible. Diseases such as ALS, Parkinsons, heart disease and others will be curable in the future. 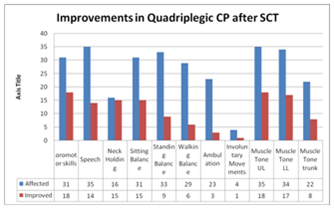 Cerebral Palsy is no exception with huge improvements in treatment occurring in the past few years. Improvements in Cerebral Palsy treatments using cell therapy are illustrated below. PCT Inc is an industry leader in contract development and manufacturing of cell therapy products and is incorporated with NeoStem Inc. In the past 15 years they have focused exclusively on cell therapy and have helped to bridge the gap between discovery and patient care. The company turns concepts into clinical practice by using constant innovation. PCT is the only contract development and manufacturing organization to have a client's cell therapy product receive approval from the FDA and have many more to come. With expertise in 25+ different types of cells and tissues, cell engineering technologies, automation, innovation, engineering and many more areas, PCT is a leader in cell therapy. As of January 16th, 2013, PCT partnered with another healthcare company called Adaptimmune Ltd which is based out of Oxford in the UK. They will be providing services to support a cell therapy product manufactured by Adaptimmune Ltd. Adaptimmune Ltd produces products containing unique engineered T-cell receptors and the goal of this is to treat cancer and infectious disease. The product that PCT partnered with them for is labeled NYESO-1c259-T and is being developed for multiple oncology indications. The 2014 UK budget established a serious commitment to science, specifically cell therapy. 55 Million dollars has been included in the budget for the new UK Cell Therapy Manufacturing Centre. The centre will have large scale manufacturing facilities that are expected to attract investments and help out exports. In addition, in order to spur innovation, the UK R&D tax credit has been raised from 11% to 14.5%. In the future expect the UK to become prominent in the cell therapy industry. With the new centre and R&D tax rate innovation is destined to occur. 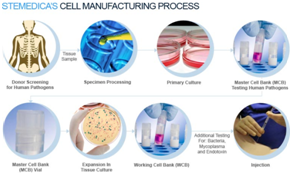 A company named Plasticell Co, located in the UK, has created a new cell culture platform which is designed to discover novel stem cell differentiation protocols. With the use of beads, tens of thousands of media combinations can be tested to find the best combination for effective stem cell differentiation. This is critical in the third step of the cell manufacturing process which is the primary culture. Cesca Therapeutics Inc. participates in the research, development and commercialization of cell based therapies that are autologous. Autologous cell transplantation typically takes only 60-90 minutes. They were formed in February of 2014 by the merger of two cell therapy organizations, Totipotent and Thermogenosis, who now together have half a dozen products. Additionally they have processed 600,000 blood samples making them leaders in developing and manufacturing both blood and bone marrow processing systems. Cesca's technologies enable the separation, processing and preservation of cell and tissue therapy products. They have exclusive distribution rights to Fortis hospital in Asia which significantly helps to lower costs. Most impressively they have a few clinical trials with very promising results. One clinical trial dealt with limb ischemia, they studied 17 patients who without treatment would have lost their limbs. One and a half years after the trial 82.4 % of the patients still have their legs. Another trial that they have performed was on a male in his 40's with Acute Myocardial infarcation. This ailment results in a low ejection fraction, and statistics show those with an ejection fraction below 40% have an 80% mortality rate within one year. Cesca's patient arrived with a 36% fraction and Cesca hoped to get a 5 % increase. Using their Surgeworks process they were able to bring this individuals fraction all the way up to 60% and he is now living a normal life. The clinical trials show that Cesca is an extremely promising cell therapy organization and has proved that its treatments work. Harvest Technologies are leaders in the manufacturing of point of care cell therapy products. They have invented cell capture technologies which make physicians capable of deriving highly concentrated and autologous cells from their patients in 15 minutes. Harvest's technologies promise to optimize the body's natural healing process. Recently, Harvest announced the launch of a new concentration system named AdiPrep which makes physicians capable of efficiently preparing highly refined concentrated adipose tissue from a sample of lipospirate. They use these tissues for use in fat grafting procedures. The AdiPrep System removes unwanted oils, lipids and infranatant fluid which results in a high quality graft material that is rich in stem cell content. Neostem is leading the way in the emerging cell therapy industry. They constantly are pursuing the preservation and enhancement of human health globally through developing cell based therapies that prevent, treat, cure, or regenerate damaged and aged tissues, cells and organs by restoring their normal function. In Neostems clinical trials they have served over 35 patients and not one of their ejection fraction has decreased after a heart attack. Recently they acquired California Stem Cell in a stock and cash deal that potentially is worth over 124 million dollars. NeoStem will begin to develop their Melapuldence-T product which is an autologous melanoma initiating cell immune-based therapy that is intended to eliminate the tumor cells capable of causing disease recurrence. While most of the cell therapy being performed today is still experimental, many researchers have come to find that many of the treatments are promising for an array of different diseases. For those suffering from leukemia and other cancers, bone marrow cells have been used in order to replace blood cells. Additionally burn victims are benefiting from cell therapy as well. Cell therapy allows for new skin cells that are grafted to replace damaged cells from the burn. For those with eye disease, dysfunctional tissues can be treated with cell therapy as well. In order to restore proper cell functioning in the human body, cell therapy is being used to replace unhealthy cells with healthy ones. Potential usage of cell therapy continues to grow as research and development increases. The identification of stem cells within an actual tissue culture is a serious challenge within cell therapy. These cultures have many cells that are all different providing a challenge in identifying the specific cell type. Once identified and isolated from tissues, it is difficult to present the appropriate solutions that must be implemented to trigger the cells to develop into the desired cell type. Once identified, isolated and grown there are additional issues involved in cell therapy. New cells require implantation into an individual and then they must learn how to function within the individual's tissues. A good example would be a cardiac cell, which once implanted may not be beating at the same rate as the persons own existing cells. This dilemma would cause the implantation to be ineffective. Lastly a person's body may reject the new cells as they are foreign bodies. Cell therapy in years to come will change modern medicine as we know it. With the development of autologous cells there has come an increase in the usage of cell therapy. Both universities and commercial companies are developing new usages for stem cells every day which presents an opportunity for the R&D tax credit.